What vacation to Sevierville would be complete without checking out Sevierville shopping? Did you know Sevierville is home to the scrapbook store with the largest inventory in the US? If you love scrapbooking Sevierville has you covered. Do you love hunting, fishing, and camping? For the avid outdoorsmen Bass Pro Outdoor World and Orvis Company Store can get your heart pumping. 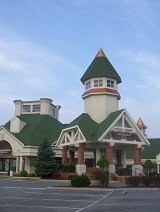 Shopping in Sevierville TN is famous with two of the biggest shopping malls in the area. Visit over 120 high end and name brand outlet stores in the malls or enjoy a delightful afternoon exploring the many antique malls and small specialty stores and boutiques. You can even shop for wedding gifts at a Sevierville outlet bridal gift shop. Sevierville Tenn. shopping offers something wonderful for everyone in the Great Smoky Mountains. Bass Pro Shops is your mega Outdoor Sporting Goods Retailer with museum quality displays and outdoor ambience. Over 200,000 sq. ft. under one roof, over 600 vendors, Clean Restrooms, Free Parking and Admission. Come to Sevierville Tennessee for shopping where fun begins in the Great Smoky Mountains.